Great Orion Nebula - Universe Galaxies And Stars Section. Great Orion Nebula - Jan 31 - Feb 6, 2005. Great Orion Nebula. Image credit: http://www.astrophoto-mallart.com http://www.axisinstruments.com. As we relaxed and viewed the "Great Orion Nebula" last week, I am sure that many of you realize this is a highly complex region of sky that deserves much more attention to detail. With the Moon satisfactorily out of the way during the early evening hours, let's take the time to do a much more serious study over the next few evenings. Tonight our goal is Iota Orionis. Known to the Arabs as "the Bright One of the Sword", we know it as the southern-most star in its asterism's namesake. Iota is estimated to be around 2000 light years away and is about 20,000 times brighter than our own Sol, but in the telescope you will find Iota to be an easy and charming triple star. The bluish B star is relatively close at 11" in separation, but a bright 6.9 in magnitude. Much more distant at 50" is the reddish C star, and far more disparate at magnitude 11. Iota itself is a spectroscopic binary and you will note another "white" double (Struve 747) unrelated to Iota about 8' to the southwest. Staying at high power, the reason I ask you to look here tonight is not to conquer a Herschel 400 object, but to study a region of the sky that would be far more impressive if it weren't for its alluring neighbor. If you look closely, you will see that Iota is involved in a great region of emission nebula known as the NGC 1900 along with a small open cluster known as H 31. To be sure, the area is vague, as are all low surface brightness nebulae, but do look to the east of Iota where a much brighter, roundish area makes an unmistakable appearance! Tuesday, February 1 - If you are up early this morning, today is the best time to catch lunar feature - Rupes Recta. The angle of the lighting will be just perfect to highlight this 110 km long feature! Please take a moment to remember Columbia - the first Space Shuttle to travel to Earth orbit - and its brave crew who left us two years ago today. Rick D. Husband, William C. McCool, Michael P. Anderson, David M. Brown, Kalpana Chawla, Laurel Blair Salton Clark, and Ilan Ramon... We wish you godspeed. Tonight let's head for the "holy grail" of multiple star systems as we look into the fueling core of the M42 - Theta Orionis. Are you ready to walk into "the Trap"? Even the smallest of Telescopes can reveal the four bright stars that comprise the quadrangle at the heart of the Great Orion Nebula known as the "Trapezium". Both the beginner and the seasoned veteran know that there are actually eight stars in this region and the journey we are about to undertake requires both aperture and fine skies. But what can you really see? All four primary stars are easy. A steady hand with binoculars and even the most modest of Telescopes make this foursome an awesome sight... And they seem to be in a dark "notch" of their own, don't they? A telescope of 150mm in aperture will reveal two additional 11th magnitude stars, but excellent skies could mean the even smaller aperture could detect them. They will appear as "red" companions to the "blue/white" primary stars. But what of the other two? The remaining two components average about magnitude 16, putting them within reach of large amateur scopes, but what would you see? When I first began observing the Trapezium area with a 12.5" telescope, I was sure that I would never see the two faintest members of the group. I was new to challenging double stars and had never looked at a diagram. (To this day, I still prefer to observe and describe things first and confirm them later. Knowing in advance what you are "supposed" to see colours what you "can" see.) I had seen the fainter stars that appeared as doubles, along with a faint wink here and there as well as one to the outside that made the whole thing appear like a pentagon. Little did I realize I was perceiving all eight members, and there seemed to be so much more just on the edge of my perception. Thus began my own personal quest to study the "Trapezium" on a more professional level, just like challenging Galaxy studies. Using the 31" reflector at Warren Rupp Observatory, it was time to "walk into the Trap" and to answer all my observing questions through visual confirmation. While at first glance with a small telescope, the background region in this area might appear a black void - it is not. The nebula continues here, but changes form. Instead of seeing "smoke-like" filaments, the region around the Trapezium is scalloped, like fish scales. You can never see this in a photograph! I realized immediately that both the G and H stars that I had always questioned were quite within range of my 12.5" as I recognized the pattern. Then a moment of perfect clarity came and the view literally exploded in dozens of stars buried within the field surrounding these eight known as the "Trapezium". Upon formal study, I found that there are around 300 such stars within 5' of the Theta Orionis complex that exceed magnitude 17. According to Strand, the expansion rate puts them at an approximate age of 30,000 years, making it the youngest star cluster known. Regardless of what size telescope you use, you owe it to yourself to take the time to power up on the "Trap". Since the time the area was revealed to my eyes in all its open glory, I have seen scallops in the nebula and both fainter members on nights with exceptional seeing in much smaller telescopes. No matter how many stars you are able to resolve out of this region, you are looking into the very beginnings of starbirth... A womb with a view! Wednesday, February 2 - Do you get up for work before dawn? Take a moment to step outside and have a look at Jupiter. Our solar system's largest planet will go stationary (retro) in its orbit during the early morning hours. You'll find it within 3 degrees of Spica! Tonight our study region is to the northeast of the Great Orion Nebula (M42) and has a designation of its own - M43. Discovered by De Mairan in the latter half of the 18th century, this emission nebula appears to be separate from the M42, but the division known as "the Fish Mouth" is actually caused by dark gas and dust within the nebula itself. At the heart of it is 7th magnitude "Bond's Star" - and wouldn't 007 be proud? This unusually bright OB star is creating a matter-bound Stromgren sphere! Translated loosely, this star is actually ionizing the gas near it, making a orb shaped area of glowing Hydrogen gas. Its size is governed by the density of both the gas and dust that surround "Bond's Star". This "exciting" star of our show is more properly known as Nu Orionis and near it lies a dense concentration of neutral material known as the "Orion Ridge". It is this combination of dust - mixed with gases - that make for a well balanced area of star formation! Thursday, February 3 - This morning at 14:00 UT, the Moon will have reached maximum libration, turning Crater Otto Struve our way. And speaking of the Moon, on this day in 1966, the first soft landing on the lunar surface was achieved by Soviet Luna 9. Spaseba! Located just a half a degree north of the M43, this tripartite nebula consists of three separate areas of emission and reflection nebulae that seem to be visually connected. The NGC 1977, NGC 1975 and NGC1973 would probably be pretty spectacular if they were a bit more distant from their grand neighbor! This whispery soft, conjoining nebula's fueling source is multiple star 42 Orionis. To the eye, a lovely "triangle" of bright nebula with several enshrouded stars make a wonderfully large region for exploration. Can you see the "Running Man" within? Friday, February 4 - Wake up, Europe! This morning the crescent Moon will occult Antares for a substantial portion of viewers. Please check IOTA tables for viewing areas and times. Klare nacht! For those of us not so fortunate, we can always look about 8 degrees north of Mars this morning for Pluto as we note its discoverer - Clyde Tombaugh - born on this day in 1906. Let's return again to Orion tonight, but preferably with binoculars since we will be studying a very large region known as "Barnard's Loop". 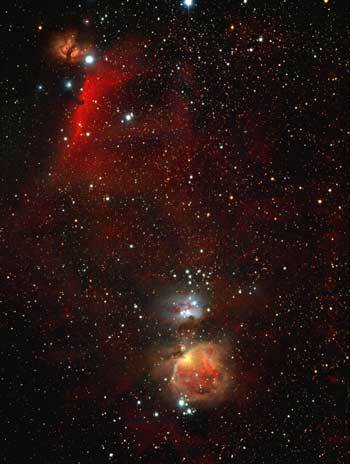 Extending in a massive area about the size of the "bow", you will find Barnard's photographic namesake to the eastern edge of Orion, where it extends almost half the size of the constellation between Alpha and Kappa. Because the Orion complex contains so many rapidly evolving stars, it stands to reason that a supernova should have occurred at some time. "Barnard's Loop" is quite probably the shell leftover from such a cataclysmic event. If taken as a "whole", it would encompass 10 degrees of sky! For the most past, the nebula itself is very vague, but the eastern arc (where we are observing tonight) is relatively well defined against the starry field. Although it is similar to the Cygus Loop ("Veil Nebula"), our Barnard Loop is far more ancient. If you have transparent, dark skies? Enjoy! You can trace several degrees of this ancient remnant using just binoculars. Saturday, February 5 - On this day in 1963, the first quasar Redshift was measured by Maarten Schmidt and in 1974 Mariner 10 captured the first close-up photos of Venus. Tonight I ask you to once again take out your Telescopes and explore a region with me that we have previously visited - the M78. It is for the very sake of amateur astronomy that I ask you to do this... And here is why! On January 23, 2004 a young backyard Astronomer named Jay McNeil was checking out his new 3" telescope by taking some long exposures of the M78. Little did Jay know at the time, but he was about to make a huge discovery! When he later developed his photographs, there was a nebulous patch there that had no designation. When he reported his findings to the professionals, they confirmed it had no official designation and that Jay had stumbled onto something quite unique! It is believed that Jay's discovery was a variable accretion disc around newborn star - IRAS 05436-0007. Little is known about the region, but it seems that it had been caught in a photo once in the past but never studied. Even the Digital Sky Surveys had no record of it! Catching what professionals had missed! Sunday, February 6 - Do you need a smile? Then look at the waning crescent Moon this morning. On this day in 1971, Apollo 14 Astronaut Alan Shepherd was the first human to "tee off" from the lunar surface! I wonder if that golf ball is still orbiting?! Tonight let's return again to Orion's "Belt" and bright eastern star Zeta. Having visited this before, we know Alnitak is a delightful triple as well as home to the incredible "Flame" and "Horsehead" nebula. Heading next to the western-most of the trio, we find Delta - or Mintaka. Even small Telescopes will be delighted to find that Mintaka is also a double with its 6.7 magnitude "blue" companion at an easy separation of 53" north of the primary. But you knew I was saving the best for last, didn't you? NGC1990 - a circular gaseous region that spans around 20 light years, fueled by Epsilon's bluish light. The NGC1990 is surrounded by "Herbig-Haro" or "HH" bi-polar jets. It is rumored that an 8" or 10" telescope at 250x will reveal these globules as 14th magnitude "fuzzy stars". What do you see? Until next week? Keep exploring the fantastic Orion region. There are many planetary nebulae and open star clusters (even a Galaxy or two) waiting for you! Do not be discouraged if you cannot see some of these things on your first try - astronomy is like anything else - it takes Practice! If you don't have skies tonight? Have Patience. And if you are still learning what type of conditions it takes to see things at their best? Be Persistent! Practice + Patience + Persistence = Perfection!